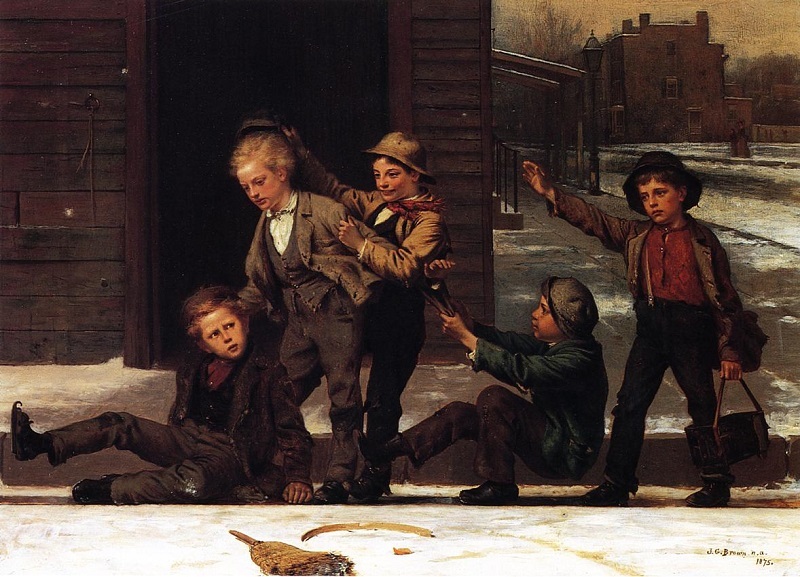 Winter Sports in the Gutter, 1875, oil on canvas by British-American painter John George Brown (1831–1913). Image courtesy of The Athenaeum. In early 1897 Stephen Crane began work on what became a series of stories and sketches set in the fictional town of Whilomville, modeled on Port Jervis, New York, where he lived for five years while a young boy. (The word whilom is an archaic word meaning in the past.) Most of the fifteen stories are about childhood, but the first and longest, his novella “The Monster,” is a disturbing tale about disfigurement and prejudice. It was published in the August 1898 issue of Harper’s magazine and, although greeted with mixed reviews (a couple of them quite hostile), it is now widely regarded as Crane’s final masterpiece. I am all fuzzy with money troubles and last night a writ was served on me by a leading creditor. . . . I must have every pennie that you can wrest from the enemy. . . . Ask them why they don’t print “The Blue Hotel” and “His New Mittens” in one volume with the “Monster” and then pay up like little men. . . . I fail to see where they get such a hell of a right to decide as to what stories shall be published in a book that bears my name in a damn sight bigger type than it bears their imprint. The three stories finally appeared in December as The Monster and Other Stories. It was the last of Crane’s books published during his lifetime. A waif like Horace? Crane had considered himself a loner since childhood. Exiled? He was persona non grata in New York City. Friendless? He had a few close friends, but believed he was destined to drift through life by himself. Poor? He had joined the Cuban campaign to defray his mounting debts in England. The year after leaving Cuba, Crane finished thirteen additional Whilomville pieces, which were published as a series in Harper’s, and he expressed the hope that all the stories set in his fictional town would eventually be gathered in a single volume. The new tales—without “The Monster” and “His New Mittens,” however—were published as Whilomville Stories two months after he died from tuberculosis in the spa town of Badenweiler, Germany, in June 1900. He was twenty-eight years old. Little Horace was walking home from school, brilliantly decorated by a pair of new red mittens. A number of boys were snow-balling gleefully in a field. They hailed him. “Come on, Horace. We’re having a battle.” . . . If you don't see the full selection below, click here (PDF) or click here (Google Docs) to read it—free!